After the painting blitz of landscapes the past few weeks, I jumped back to painting flowers again. I’m teaching a flower painting class in October, watercolor / pen and ink, so I wanted to have some more work for the class. 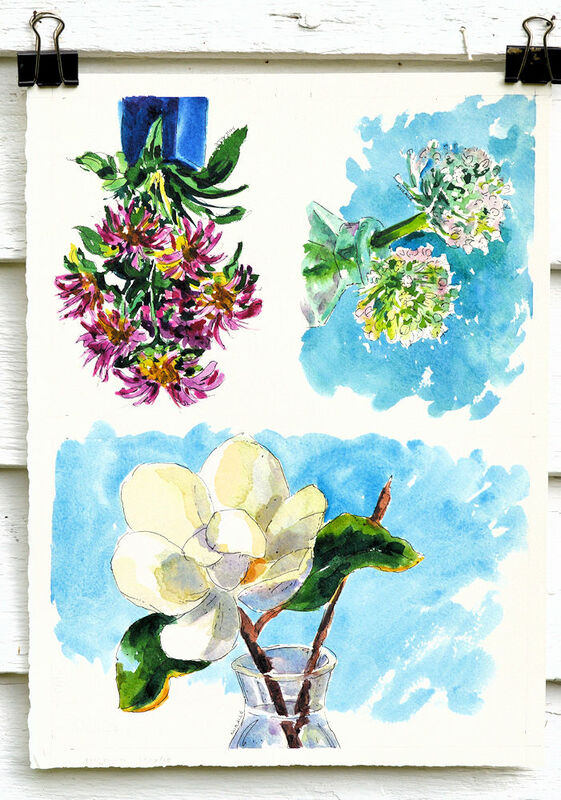 All of the flowers I depict pretty much come from my own property. Even though they’re seasonal, it seems as if we always have something in bloom, either cultivated plants or wildflowers. One has to be pretty quick sometimes because the blooming season passes quickly and some plants I’ve missed. I needed to catch up on photographing paintings today. In the old days of film cameras, I used to have to order special film from New York, special lights and filters, then set everything up in my studio with total black-out curtains. The lights were hot and it was a real pain. These days, with digital cameras, I just hang the paintings on the side of my studio, either on overcast days, in the shade, or on the north side. As long as it’s in focus and square to the camera plane, photo editing programs will take care of the rest. 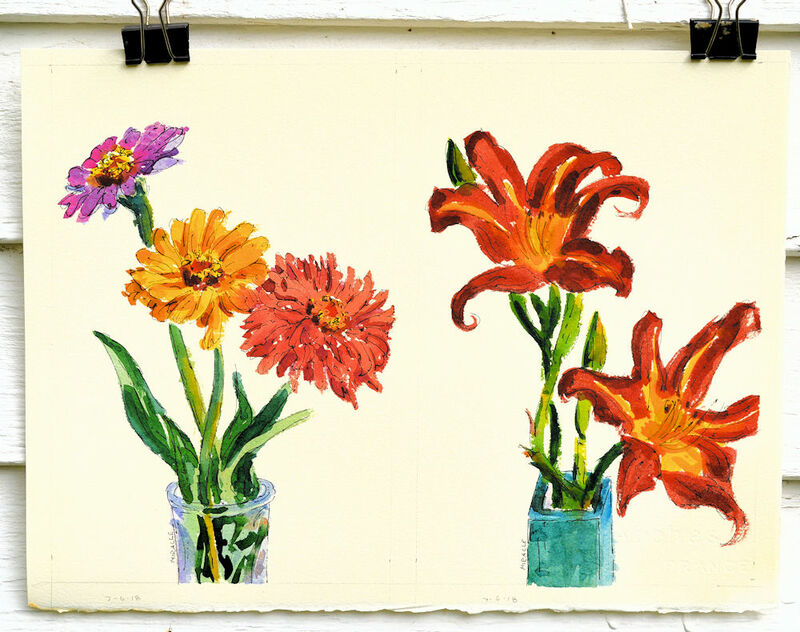 For the flower paintings, I divide a full sheet of watercolor paper (22 x 30) into quarters. Each quarter is then divided into smaller sections, either four, three or two. I tape these down to a board and work on them that way from the actual flowers. Orange cosmos and a mixed bunch of purple and lavender cosmos. Watercolor, pen and ink, Kit Miracle. The orange cosmos is topping seven feet now! Can’t believe it. 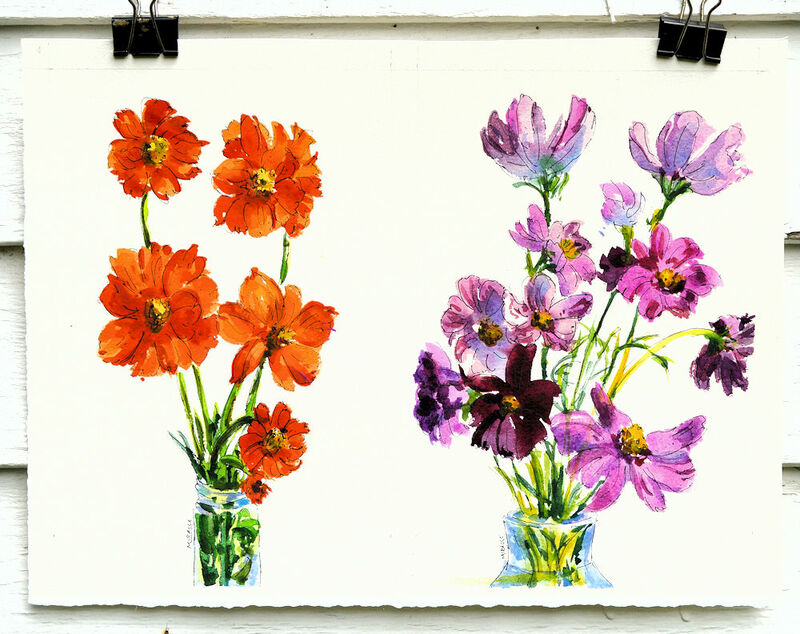 The style is a very loose, not botanical studies, but lively, colorful depictions of the flowers. My whole aim is to capture the spirit of the flower, its uniqueness and what makes it special and different. I’ll have some of these up on my Etsy shops soon so if you’re interested, check them out. Etsy: my90acres for the small paintings and KitMiracleArt for the larger ones. This entry was posted in pen and ink, watercolor and tagged flowers, kit miracle, pen and ink, watercolor. Bookmark the permalink.